Since some friends went on a bat and moth walk (and I’d idly Googled bat detector kits) I’ve been curious about building my own bat detector. A few things came together and we ended having a lot of fizzPOP conversation about bat detectors. Then I started work on a school project for which an ultrasound detector would be rather nice. It was kind of inevitable that I’d make one then! Working from Tony Messina’s Simple Bat Detector project, I gathered together the basic components and tonight managed to get a breadboarded prototype working. It occurred to me that building something that reacts to ultrasound may not be the easiest of circuits to test… Fortunately, I had some sonar goggles to hand and the detector reacts to them! sonar goggle detector from nikkipugh on Vimeo. Mr Mabbett also suggested placing the detector near a TV set (which I don’t have) or some jangling keys (which I do!) to test it. There are some good clicks coming from the keys test too, so next step is to get the circuit soldered up onto stripboard and into an enclosure of some sort. Toy mp3 player, soon to be more with light and sound than the manufacturer anticipated! 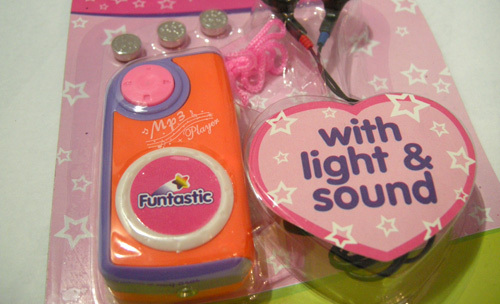 We’ll be converting one of these toy mp3 players so that the sound it makes is controlled and distorted by light. Circuit bend for It’s a Geek’s World. from nikkipugh on Vimeo. 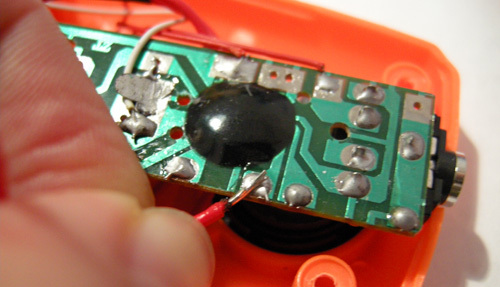 The mod is pretty simple – so don’t worry if you’ve never soldered before – and as you can see from the video above the results are very engrossing. The kits come with earphones, so you can even play with them for as long as you like without risking familial discord! 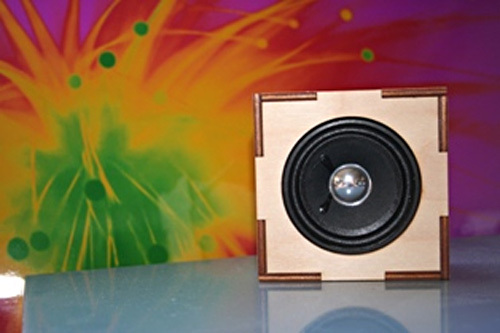 Alternatively… there’ll be another workshop where you can make your own audio amp. Yeah! We'll switch over a couple of components to make the toy sensitive to light. The workshop costs £3.50 and at the end of it you’ll have your very own bleepy chirpy tinkly thing to keep. To reserve your place in advance you need to register on the It’s a Geek’s World website and then you can sign up for the different activities. There will also be a few places available to snap up on the day. My workshop runs at 10:15, 12:15 and 3:15. The website is mostly booking system and doesn’t really show much of what will be going on, but take it from me: if you like gadgets, robots, and/or electronic noise then this is the place to be. 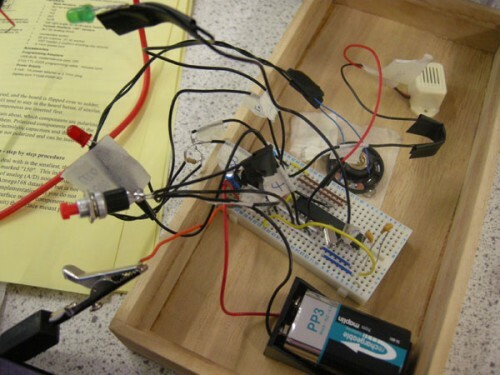 There are several workshops on offer throughout the day, ranging from learning to solder through to making a Beat Box sequencer with Mr Underwood. Something for everyone! Nottinghack will be there with Drawdio kits. We had a fab evening when they came to fizzPOP for a Drawdio workshop, so that’s also tried, tested and approved! 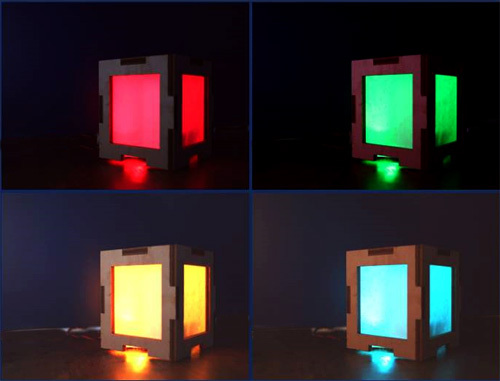 We’re not neglecting the blinky light side of things either – there will be workshops for making these colour-changing boxes and a few other LED treats too. As well as the workshops there will be people from Curious Minds (they of the Star Wars Force Trainer), oomlout, RobotBits and others. Expect interesting things to see, touch and interact with. Others from fizzPOP will of course be there too, so come along and say hi – we’ll say hi back if we can hear you over all the bleeping noises! Over at fizzPOP we’re exploring group dynamics and how to strengthen our community at the same time as running compelling events and extending our skills. 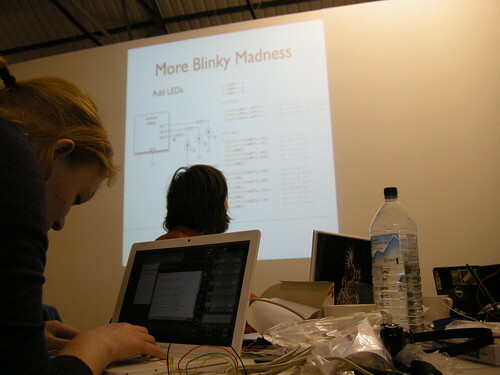 We’ve been doing free-style hack sessions for over a year now and we’ve also run a fair number of workshops and events (Such as Howduino and Theremin Day) on specific areas. We’ve been paying attention and, whereas the atmosphere at the events we run is absolutely fantastic, it’s not sustainable for us to run things at this level on more than an occasional basis. We can however incorporate elements of the big events into the little things we do every fortnight. Right back in the beginning we pondered on the importance of shared goals and working as a group. We’ve recently returned to this with themed sessions – Hack a Toy and Processing Anonymous being two examples. Starting on Wednesday the 18th of August we’ll be experimenting with themed hacksessions on a more formalised basis. You’re still welcome to come along and work on individual projects if you like, but the steering group and other members of fizzPOP will be taking it in turns to initiate and coordinate clusters of activities around particular themes. It’s really interesting watching theses themes get negotiated online as people discuss what skills they can share and also what skills they would like to acquire. Since there’s a bunch of us interested in building our own modules, I’ve been able to buy a load of components in for a lower price than compared to smaller quantities. 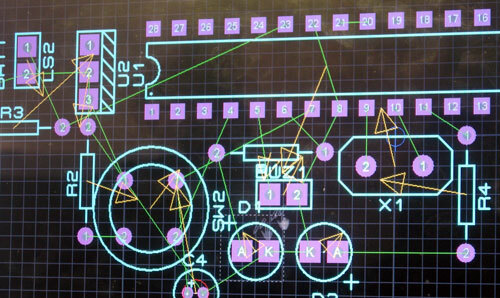 I’ll be selling components for a bare bones Arduino (NB, it really is just the basics!) for £4.50. This is significantly cheaper than the £25 or so you’ll pay for the full-blown board and, as an artist, it’s what makes multiples and building things like the sonar goggles possible in my work. So, if you’ve dabbled with Arduino before and are looking to take things to the next level, or perhaps you’ve not yet dipped a toe in because you’ve found the cost prohibitively expensive, than this is the session for you. It won’t be a formal, led workshop, but there will be a room full of people applying their brains to related challenges and with assorted relevant kit etc. Think of it as being in a room with 20 mentors. invisible noise from nikkipugh on Vimeo. 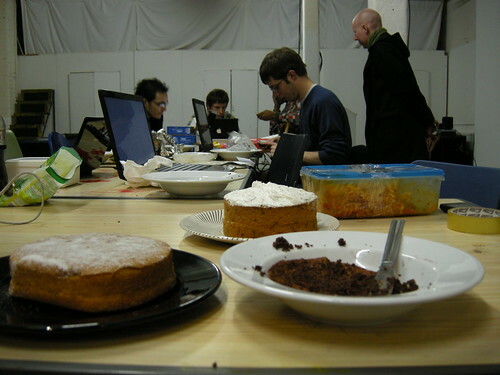 We meet on a fortnightly basis at The Edge for our informal hacksessions at which you can just pop in, have a mooch and/or work on a project (we can always find stuff for you to get involved with if you’re a beginner). This year we’ve also been ramping up the volume with a programme of workshops and events. The next of these will be Theremin Day as organised by Sam Underwood (also featuring in the video above!). The afternoon workshop sold out rather rapidly, but tickets are still available for the evening of live performances. In May fizzPOP will be in residence at independent artist studios The Lombard Method for an intense two weeks of workshops and making of stuff, 1st – 16th of May. Stand by for more details of how you can get involved with making contraptions and contributing to blinky light extravaganzas! There’s loads more in the pipeline too, with the British Science Festival in September, exciting partnerships with Aston University Eng Soc, robots, Arduinos and dorkbotbrum. No surprise then that we’ll be moving to weekly hacksessions after Easter in order to try and fit in everything that we want to do! box with a secret knock in it. from nikkipugh on Vimeo. It’s proved to be very popular, so it’s time to take it out of its prototyping stage and into something a bit more robust. The version I’ve been using so far runs off a Real Bare Bones Board mounted on a breadboard. It’s OK, but I need to keep checking it all the time to make sure the wires haven’t come out. Not ideal if you’ve got a dozen young children clamouring around to try and guess the hidden knock! I could move it to perfboard or something similar, but I suspect I’m going to be making several of these in the future, so I’m using it as a project to learn a bit about making Printed Circuit Boards (PCBs). The first stage has been to eliminate the RBBB and move to a freestanding chip. I followed the approach on the Standalone Arduino / ATMega chip on breadboard Instructable. 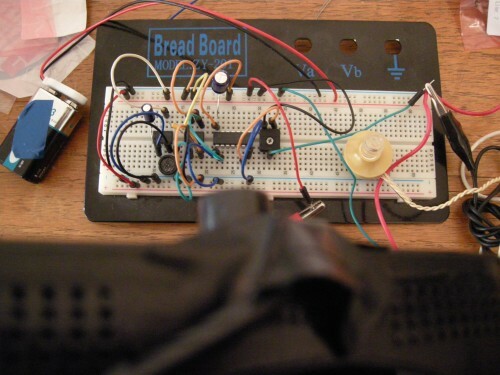 I then combined this with the power supply from this ITP tutorial on breadboarding an Arduino. And finally added all the switches and gubbins from the original circuit. …and was a nice bit of learning too – I feel all empowered now! Putting it all together. With arrows. Having ascertained that it wasn’t all going to go fizz or POP, the next stage is to start arranging all the bits into a nice PCB layout. …And for me to profusely thank Dr Sugden and the Eng Soc students at Aston University who are proving to be top notch fizzPOP collaborators and walked me through this afternoon’s learning. Much appreciated. 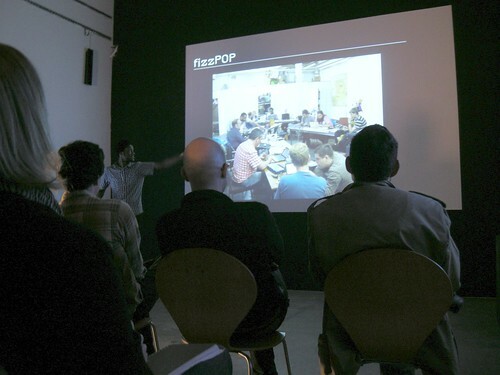 Last night at our fizzPOP hack session we celebrated the group’s first birthday. 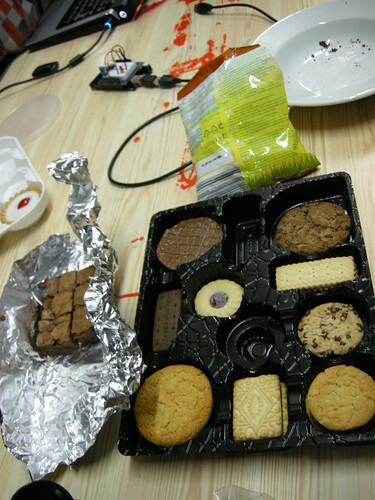 Chocolate brownies, jammie dodgers, humidity sensor LED candle. fizzPOP (so named as a reference to the Lunar Society) came into being just as I returned form a residency at the Banff New Media Institute and was pondering how on earth I was going to develop my skills and practice in a city with an apparent lack of peer group. 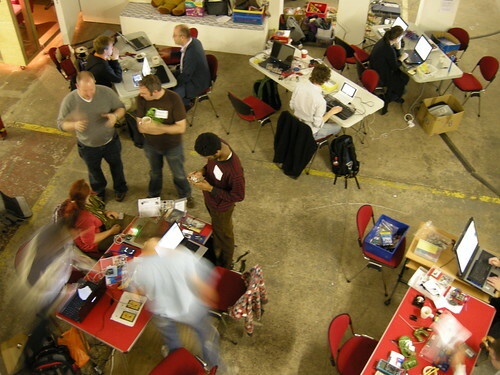 I’ve been heavily involved in the organisation of the hackspace (working with Antonio Roberts and others) since the early days and seen it grow from laptop-orientated meetings in pubs through to regular practical sessions held at The Edge. I’m happy to be able to report that I’ve learned loads and am constantly meeting new people who provide skills and ideas that feed into my work (and play!). There are big plans for our second year – look out for more in the way of events and workshops, as well as continuing to develop the hacksessions that form the core of what fizzPOP is about. 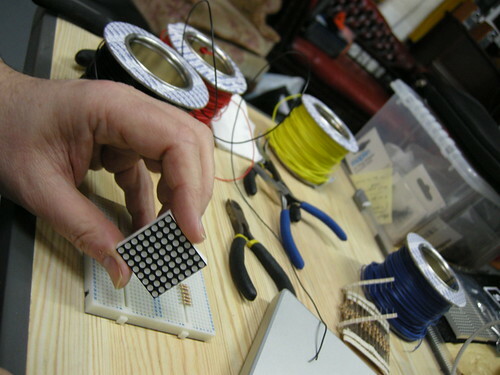 LED matrix: GB contemplates colour mixing, simple graphics and very small numbers. Following on from the artist-led spaces podcast, there have been various other fizzPOP-centred events and conversations recently. On Thursday 19th of November, Antonio Roberts gave a presentation to the Eastside Projects associate members. In the short time available he gave a very good, comprehensive, whistle-stop tour of how the hackerspace came about, what we do there and what our aims for the future might be. The bit that has stuck with me most though, was when someone in the audience asked what kit we hoped might furnish a more established fizzPOP with. Antonio’s response included the usual basic toolkit of soldering irons etc etc, but then for his ambitious one-day-we’d-like-to-have item he went on to mention web servers. That would never have even occurred to me! Now, Antonio comes from a graphics/code sort of a background, and I come from more of a maker/sculptural background. If I’d have been asked the same question, I would have answered with something along the lines of a laser cutter or a rep rap for rapid prototyping of physical objects. My point is not that one or other of these answers is right or wrong, just that it was a timely, healthy reminder that fizzPOP plays host to a really diverse range of people and that, if we asked 20 people that question, we’d quite likely get 20 different answers! Right from the beginning we’ve said that the community is our number one priority and as fizzPOP grows it will be interesting to see what shape things settle down into. On Saturday the 21st of November, fizzPOP and Howduino joined forces to host a day-long hacking event at VIVID as part of the Hello Digital fringe events programme. This is something we’ve been itching to do for some time since our regular Wednesday evening haunt, The Edge, can only hold about 15-20 people and we’re only there for a couple of hours in the evening once a fortnight. Saturday was intense and involved about 40 people, whatever stuff they bought with them and lots and lots of ideas. It was amazing to see how all these ingredients got circulated around over the course of the day. We certainly filled the space! fizzPOP regular GB did a sterling job of compiling and delivering beginners’ workshops introducing people to the basics of the Arduino platform. This led to messages such as “Woo Hoo! I’ve downloaded a program onto the board & successfully have an LED winking @ me! :) Thanks 2 the wonderfully patient Howduino team” [@IonaMakiola] and “My first ardunio (technically a freeduino) http://twitpic.com/qct4g Never been so proud of turning on a light on before” [@TigersHungry] being posted on Twitter. TigersHungry has also written a fuller account of her learning experience on her blog. At the other end of the skills spectrum, we also had two proficient hackers teaming up to work on projects together. Arvydas and Stewart could be seen running around the gallery space testing the autonomous robot car they’d programmed to recognise and avoid obstacles in its path. Check it out in this video avoiding even a pencil-sized object! Arvydas has written up the project on his website, and there’s also another video from the show and tell session at the end of the event. Whilst that was going on kids were making lego robots, Antonio was making wailing noises, Bubblino was doing its thing and, in return for a bit of soldering instruction, Helen helped me patch up my sinister glowy-eyed teddy. Nicky Getgood and her mum popped in for a bit and were moderately baffled by the whole thing. When, whilst being interviewed by 6-year-olds the following Monday I described the “inventors’ club” my friends and I had set up, their eyes sparkled with excitement! I’ve indicated as much before, but it’s worth saying again: I love fizzPOP as a space where I can go to learn things, to teach things, to be exposed to new ideas and to just try things out without risk of ridicule if it all goes horribly wrong. Evidently other people feel the same way: several people clocked up round journeys of about 200 miles to attend the Howduino event (Bath, London, Milton Keynes, Hertfordshire and, of course, Adrian and Thom coming from Liverpool). Others came from Leamington and near Banbury, as well as a more local Birmingham contingent being present. Despite going from strength to strength at the moment, fizzPOP will be going a bit quiet over the coming months due to the combined effects of heating costs for the warehouse space we hold our hack sessions in and a Christmas break. We’re looking to hold at least one more hack session before we go – add your name and preferred day to this poll. Though we may become quiet in practical terms, behind the scenes we’re also beginning to think about how we can develop fizzPOP’s activities and give it a more stable base from which it can operate. We’ve seen that the demand for this sort of a space exists, and we know we won’t be able to hold our hack sessions at The Edge indefinitely, because at some stage it will need to be reclaimed as a studio and exhibition space. If you know of anything you think we should be aware of – be it a potential advocate, source of funding to help us get started up, or some bricks and mortar that are available, please get in touch. hippo joy from nikkipugh on Vimeo. I’m liking this circuit-bending stuff. It’s making me do things I don’t want to do. Restraining myself from immediately unscrewing the back and tinkering with the innards without having properly explored what the ‘normal’ behaviour is first. I must make more of an effort to document this too. Choosing the 3 or 4 bends from several that I’ll try and work with. This is usually a balance between the “awesome!” and the practicality of getting wires and soldering irons where they need to get to. I ‘lost’ a really nice bend in the hippo – the behaviour changed when I soldered the switch wires onto the board. I’m starting to get into the habit of making audio recordings of the initial noodling noises. Revising the previous decisions, based on what switches you can accommodate in the shell. Making the first incision. Usually my electric drill is hilariously large compared to the toy I’m working on: one of these days the toy’s just going to disintegrate. It’s also a very definite point of no return. I’m slowly getting better at drilling holes a few sizes too slow and then taking them up to size with a file. Neater results, but there’s still room for a lot more improvement. I’ve also started thinking a bit more about the feel of the switches – adding in rubber o-rings to cushion body contact points etc. Similarly for the first solder, but given extra edge by the memory of all the circuit boards I’ve managed to kill in the past. I’ve circuit-bent a few toys now, all with similar push-to-make switches and body contacts. An important edge is coming up where I’ll have to learn new stuff. With the hippo bend I made myself repurpose the existing switches. It’s a bit of a bodge, but it was worth the brain-wracking to come up with a (hopefully more than temporary) solution that a) works and b) is satisfying in the way that it looks and touches. I just wanted to say that the fizzPOP hackerspace is increasingly becoming the communal, collaborative production space for unpredictable creative things that I was hoping for when I left art school. Actually, come to think about it, in many ways it’s quite like what I hoped art school would be.